Rocking the high contrast coordinates today. My second styling of matchy trend. For me, It's an easy look to go from day to night. Black and white from head to toe can come across bland out by mixing two colors, you instantly look fresh and fabulous. And of course, you can pull them out of your closet any given season and still look fashionable wearing it. How'd you like these timeless pieces? Hey Romwe fashionistas! 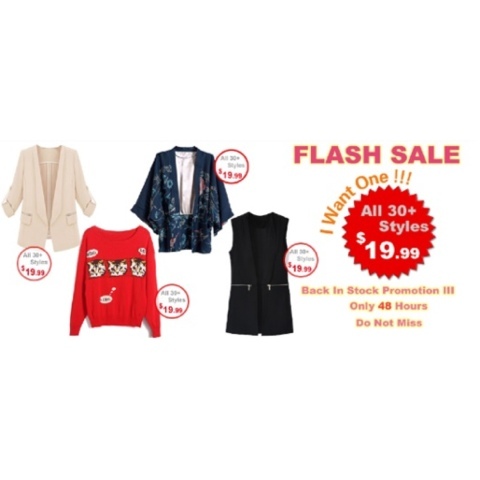 Here's another flash sale! Click the photo below to check the "back in stock" promotion. Hurry and Have fun shopping! That print is stunning! So gorgeous. JOIN MY BLOG RELAUNCH GIVE AWAY and win accessories and other adorable stuff!